How are Dental Implants Placed & Who Should do it? PERIODONTIST! Dental implants are a marvel of modern dentistry. People who have failing or missing teeth due to genetics, accidents, or any other reason can get their teeth replaced for life using dental implants. There are several stages to a dental implant treatment. Note that this is an outpatient surgical procedure. To start off, your damaged tooth/teeth will be removed. If your jawbone is very thin or soft, then you may require bone grafting surgery. In this procedure, a piece of synthetic bone will be placed in the area of your jaw that is lacking natural bone. It takes some time for the grafted bone to become strong enough to support an implant, anywhere from 4 – 9 months. Once the jawbone is ready, the surgeon will place small titanium posts in your jawbone. It can take as much as 6 months for these posts to integrate with your jawbone. After this healing period, the surgeon will place the abutments, i.e. the extensions of the posts, and these will support your new teeth. Most people think that any dentist can place dental implants. However, today dentistry has advanced to the extent that you need to consult specialists for different treatments. Periodontists are specialists that complete 2 years of post-graduate training and specialize in treating gum disease, placement of implants for teeth replacement, and other cosmetic and functional procedures. If you are looking for an expert periodontist in Las Vegas, contact Dr. DeAndrade at the Anthem Periodontics and Dental Implants center. Dr. DeAndrade has spent a greater part of his career advising patients to dump their dentures in favor of dental implants. Schedule your appointment right away. 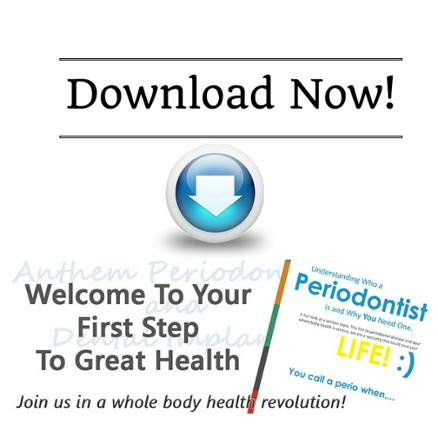 To learn more about what a periodontist does, we offer a FREE eBook! Download it today and read it whenever you’d like!